Welcome to Something Extra in Pigeon Forge! 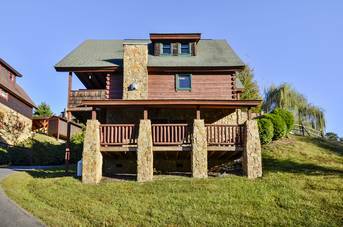 This cozy, luxurious 2 bedroom, 2.5 bath Smoky Mountain cabin rental is ready to wrap you in complete comfort. Conveniently located just off the Parkway, you’ll have quick, easy access to the Tanger Outlet Mall, dining, shopping, Dollywood and Dollywood Splash Country, theaters and everything else that make the Smokies such a wonderful place to vacation. As soon as you enter Something Extra, you’ll be mesmerized by the beauty that surrounds you. The breathtaking living room features a brand new cozy couch and Queen Sleeper Sofa, quiet sitting area, brand new flat screen TV, deck access and a crackling fireplace. Just off the living room is the gourmet kitchen with all of the necessary utensils and appliances to prepare, cook and serve your favorite meals while on vacation in Pigeon Forge included brand new island and bar. There’s also a nearby dining table waiting for your favorite dishes and the company of family and friends. On a beautiful day in the Smoky Mountains, take your meals outside and grab a seat on the patio table located on the covered deck. Take a trip upstairs and you’ll enter the luxurious master suite. The entire second floor is dedicated to your ultimate relaxation and tranquility. Here you’ll find a wonderfully cozy king bed, sitting area, enormous two person jetted tub, flat screen TV, private covered deck and an in-suite full bath with separate shower. Venture down to the lower level at Something Extra you’ll enter the second bedroom and game room area. Here you’ll find a king bed, pool table, full-size sofa sleeper, flat screen TV, PlayStation 2 and 3, full bath, private deck access and even your very own deck access for hours upon hours of enjoyment and relaxation. When your day comes to an end while vacationing in the Smoky Mountain, you’ll definitely want to relax and unwind in the bubbling outdoor hot tub and enjoy the brand new outdoor deck furniture. Luxury meets the mountains at Something Extra and nothing has been forgotten to ensure that you have a spectacular and wonderful time in the Smokies. Reserve your stay at this remarkable cabin today! Something Extra Average Rating: 4.8 / 5 based on 12 reviews. Cabin was great despite all the rain and flooding some of the places we normally go were closed. Sorry about waking Debbie at 5 in the am . She was awesome as always . We loved everything about this cabin. If you want to be close to the outlet mall and restaurants yet secluded in a nice clean cabin, this is the place for you. It was perfect for us 4. Thank you for being so kind and easy to work with. We will be staying here again! Our trip started out rocky. After the hot tub was fixed it turned out to be a great trip. Gorgeous cabin. Cabin in great location. Had quick access to everything. Enjoyed the floor plan as it gave us plenty of room to spread out. Had all the amenities we needed to stay an entire week. Would definitely stay there again. This was by far the best place me and my family have stayed in Pigeon Forge. The location is perfect. It is easily accessible to Dollywood, Gatlinburg, and other attractions. The Super Wal-Mart was less than 1 mile away which was very convenient. It is located in a quiet sub-division. The three porches offered a view of the mountains. I give Something Extra five stars. My family and I will definitely stay here again. The cabin was very nice. There were a couple of things I would have changed about it but overall the family enjoyed it. I loved that we were only about 5-10 minutes out of the city. We plan to book with summit cabin rentals again in the future. Great place! We loved the place! I was unaware of the discount for reoccurring customers. We used summit a few years back. Thank you! This cabin was fantastic! Great location being close to everything and was packed full of amenities. We would definently recommend this cabin for a family, romantic getaway or girls weekend. We had a wonderful stay at Something Extra. The cabin was beautiful and perfect for our family. There were 4 adults ,4 children and the family pooch and we were all quite comfortable. We enjoyed every moment spent in the Smokies and really hated to leave. The kids are asking if we can go again next summer? Loved the cabin, the location was great... we enjoyed our stay!! !